Our fire & public safety personnel are genuine heroes who deserve the best, right down to the facility floors they depend on. The unwavering strength they show every day should be matched by their surroundings, and our flooring systems for fire & public safety environments are just the solution. Because the call to action can come at any time, emergency vehicles and the flooring around them must always be well-maintained. 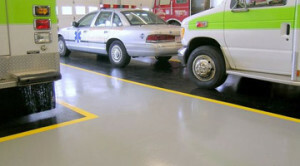 This means that the repair bay flooring for ambulance, fire engine and police transportation fleets must be skid-resistant and easy to clean. When the alarm goes off, there’s no time for slip-and-fall accidents or the concern that a dropped piece of equipment will permanently damage the floor. Our slip-resistant fire & public safety flooring solutions are resistant to the fluids and solvents used to keep emergency fleets in top shape. The proper concrete epoxy floor coating solutions and other formulas help dissipate the impact of dropped tools, which can seriously damage weaker floor coatings. In the locker rooms, offices, and other common areas of EMT and other fire & public safety facilities, flooring must withstand traffic 24/7. These high traffic operations need heavy-duty floors that look as good as they perform. Many typical flooring options can’t accommodate these high demands, but tight local and municipal budgets can’t always affords high-cost alternatives. 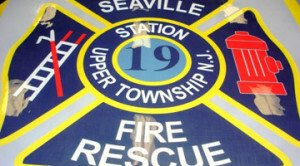 That’s where our decorative, high-performance fire & public safety flooring systems come in. We offer a large selection of colors, patterns and textures that are specially-formulated for the rigors of constant heavy traffic without becoming cost-prohibitive. These hard-working, slip-resistant floor finishes are installed with minimal downtime and maximum performance, and are easy to clean and maintain. Select an integral cove base and optional antimicrobial properties to help keep bacteria and mold at bay. With so many outstanding concrete floor coating systems to choose from, it’s no surprise that these solutions are a favorite with fire, EMT and public safety facilities. Learn more about which options are best for your fire & public safety flooring!